Inspired by the unmatched style of legendary fashion innovator and connoisseur of ethnic embellishments, Iris Apfel, Jimmy Choo has created the ultimate homage to the queen of quirky fashion. The bold hand-woven, leather macrame heel, aptly named the IRIS sandal, is embellished with multicolored resin ornaments - an ode to the magpie style and bold layering of tribal and ethnic jewelry by Iris Apfel. 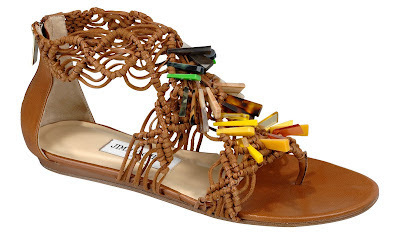 The tribal and ethnically decorated Jimmy Choo IRIS Sandal is part of the Jimmy Choo Spring/Summer 2012 collection. The same multicolored cascade of resin and woven leather also appears in similar splendor on HOLLY a flat sandal (featured above) and XARA, a fringed bag with woven wooden beads, a tassel of resin chip ornaments, and multicolored chain-link strap.